For the past eleven summers, our family has spent as many weekends as possible on Tims Ford Lake. 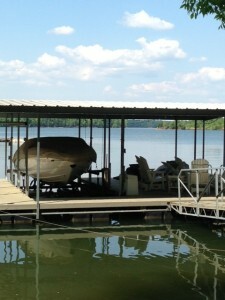 We enjoy swimming, water skiing, jet skiing, grilling out with friends and all of the other fun the lake has to offer. But, in those eleven years, there have been some unspeakable tragedies as a result of electrocutions. Second, regardless of if you are are buying an existing dock or having work done, be sure to have the State inspect the dock prior to use. This is just a second set of eyes looking for any problems. Now unfortunately, even if you do all of this, you might still have a problem. Why do I say that? Because even if your dock is in tip-top electrical condition, your neighbors dock, especially if it is close to your dock, could still pose a hazard. If voltage is leaking into the water from their dock, it has the potential to harm swimmers at your dock. Electricity and pure water are not a dangerous combination. In fact, pure water can be used to cool high voltage equipment. But, the impurities in most water act as terrific conductors and that combined with your entire body being wet can be deadly. So how do you protect yourself in such a situation? One option is to install a voltmeter on your dock. The voltmeter will alert you if there is any electrical charge in your water. A voltmeter will run you about $250.00 plus installation costs, but the peace of mind it provides is immeasurable. As you open the dock for the day, simply glance at the meter and confirm everything is safe. Enjoy your summer. And if you or a loved one would like to discuss an electrocution accident, please call one of our award-winning attorneys for a free, no-obligation consultation. We handle all accident cases on a contingency basis. Call us anytime at 615-742-4880 (Nashville) or 615-867-9900 (Murfreesboro) or 866-812-8787 (toll-free). Or, you can contact us online.